RStudio Connect v1.5.4 - Now Supporting Plumber! We’re thrilled to announce support for hosting Plumber APIs in RStudio Connect: version 1.5.4. Plumber is an R package that allows you to define web APIs by adding special annotations to your existing R code – allowing you to make your R functions accessible to other systems. Below you can see the auto-generated “swagger” interface for a web API written using Plumber. Like Shiny applications, RStudio Connect supports one-step publishing, access controls, logging, and scaling for Plumber APIs. Visit the documentation for guidance on publishing APIs to RStudio Connect. 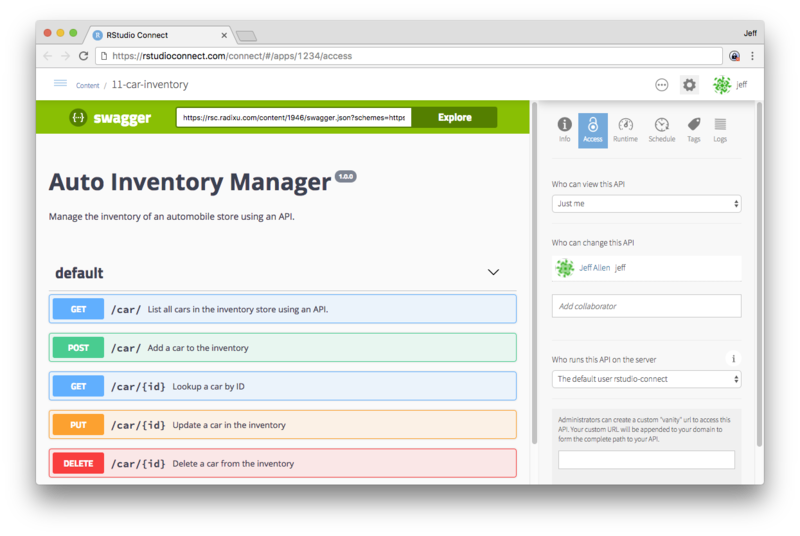 Users may now create and manage personal API keys that will allow them to programmatically access APIs that require authentication; see the user guide for more details. Content search - On the content listing page, you can now search across all deployed content by title. Official support for using PostgreSQL databases instead of SQLite. When configured appropriately, PostgreSQL can offer better performance. You can find documentation on configuration and the built-in database migration tool here. No customization of external usernames - When a username is obtained from an external authentication provider like LDAP, RStudio Connect will no longer offer the user an opportunity to customize the associated internal username. Previously this situation could occur if the username obtained from the external provider included a special character that RStudio Connect didn’t allow in usernames. Now, whatever username is provided from the external provider will be used without complaint. See the admin guide for more details. Upgraded our licensing software - 1.5.4 includes new licensing software that will minimize user issues and report errors more clearly when they do occur. This release also includes experimental support for floating licenses which can be used to support transient servers that might be running in Docker or another virtualized environment. Please contact support@rstudio.com if you’re interested in helping test this feature. Added a health check endpoint to make monitoring easier. See the admin guide for more details. Added support for Shiny reconnects. This enables users to reconnect to existing Shiny sessions after brief network interruptions. This feature is not yet enabled by default but you can turn it on by setting [Client].ReconnectTimeout to something like 15s. The [Authentication].Inactivity setting can now be used to log users out after a period of inactivity. By default this feature is disabled, meaning users will remain logged in until their session expires, as controlled by the [Authentication].Lifetime setting. Additionally, we now do a better job of detecting when the user is logged out and immediately send them to the login page. Support external R packages. This allows you to install an R package in the global system library and have deployed content use that package rather than trying to rebuild the package itself. This can be used as a workaround for packages that can’t be installed correctly using Packrat, but should be viewed as a last resort, since this practice decreases the reproducibility and isolation of your content. See the admin guide for more details. If they exist, inject http_proxy and https_proxy environment variables into all child R processes. More documentation available here. RStudio Connect now presents a warning when it is not using HTTPS. This is to remind users and administrators that it is insecure the send sensitive information like usernames and passwords over a non-secured connection. See the admin guide for more information on how to configure your server to use HTTPS. Alternatively, if you’re handling SSL termination outside of Connect and want to disable this warning, you can set [Http].NoWarning = true. RStudio Connect no longer leaves any R processes running when you stop the service. When the rstudio-connect service is restarted or stopped, all running R jobs are immediately interrupted. LDAP group queries are now cached for approximately ten seconds. This can significantly improve the load time of Shiny applications and other resources when using an LDAP server that contains many users or groups. Additionally, LDAP user searching has been improved to better handle certain configurations. You can see the full release notes for RStudio Connect 1.5.4 here. You can expect the installation and startup of v1.5.4 to be completed in under a minute. Previously authenticated users will need to login again when they visit the server again. If your server is not using Connect’s HTTPS capabilities, your users will see a warning about using an insecure configuration. If you’re doing SSL termination outside of Connect, you should configure [Http].NoWarning=true to remove this warning. If you’re upgrading from a release older than 1.5.0, be sure to consider the “Upgrade Planning” notes from those other releases, as well.